Over the past weeks, I have received heartwarming notes and letters from friends and I could never be grateful enough for the overwhelming love and thoughts of everyone. But allow me to share one letter, which somehow filled the emptiness I feel inside me. It is a letter that speaks not about me but what kind of parents I have in the eyes of a friend – their generousity, their love, their friendship. And she is right, the freedom and trust that my parents gave me, made me the person I am today. 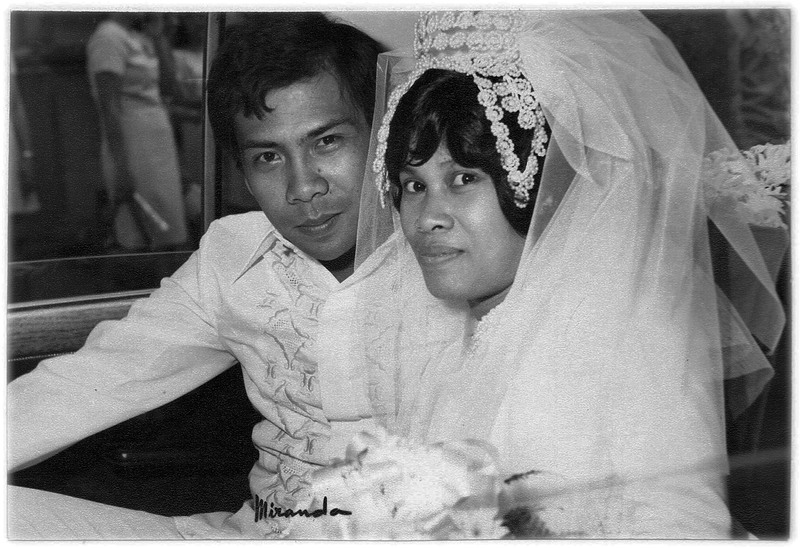 Each time I think of your parents, I think of those beautiful moments in Bulacan for my first missionary journey after my first profession in 1994. More than a dozen Daughters of St. Paul flocked in the Church of San Jose Del Monte Bulacan for our summer apostolic program… We were distributed two by two per household. It was your parents who took us from there to your home… Your home became our home… Your red car became our car. Kuya Tony used to take us to the Chapel every morning for Mass, in the afternoon for an hour of prayer… then at night for some animation activities for families. Well, you were not in your house most of the time… You were studying at Polytechnic University of the Philippines… That’s what I heard from your parents. At that time, I thought you were unreachable… But to my surprise, you were interested in books… But the type of books you liked were not in our square black bags. You preferred classics like “Interior Castle” and the like… I thought, we would never interact… but one day, you asked to come along on a Saturday morning when we were headed to Pleasant Hills chapel. I told you that it’s a long way to the Church and that we have to spend long time to pray… So we left… To my surprise, I saw you at the back pew, kneeling down… praying. You were never discouraged… Remember, that time we left Bulacan? You wanted to come along but there was no more space as one van was loaded with Sisters and the other van was filled with books and personal things. We said, “Goodbye, Adnelle. Goodbye everyone…” In our convent in Pasay, a few minutes after taking lunch… ready to take a nap… my name was paged, “Paging Sr. Athens, you have a visitor.” To my surprise, it was you! Your parents trusted you so much… They allowed you to travel alone. It wasn’t a short distance from your place to our place. … Your parents allowed you to roam around… You brought a cake for my birthday in Marikina, I remember that! You were a full time student at that time which only means that you charged them for that cake but they did not mind… Then for my perpetual profession in June 2000… You issued 12 cheques as monthly support to the projects of the Daughters of St. Paul. Your parents never questioned you for that, I’m 100% sure. …Then in August 2000, I left for Pakistan… You found ways to keep in touch… to update about your parents, your career and your vocation… Then we spent some time together during my short holidays at the beginning of year 2003 where your parents were with us for lunch… Remember the barbecue? I could go on and on… I admire the many ways you reached out… with the approval of your parents… When I mentioned this morning to Kausar (she looks like you), that one day, you will find the time to visit Pakistan, she was extremely happy. We hope that you don’t feel alone… Your parents wouldn’t like that… We are in communion with you and the rest of your family and relatives. Thanks so much for sharing…. so heart warming. 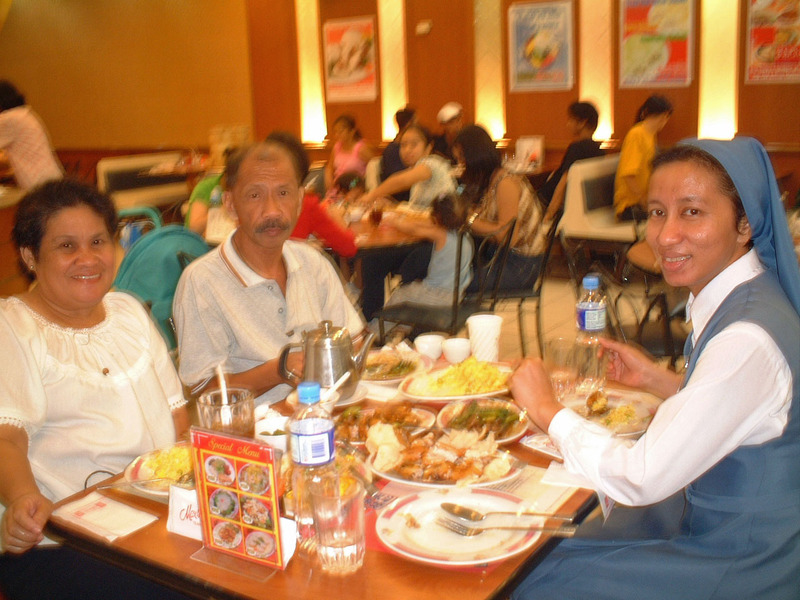 Thank you for posting the picture of your Mama and Papa. Sr. Athens was right… you are what you are because of them . And now, your parents will continue to guide you more intimately and beyond limits. God bless and strain froward! We really miss the friendship and the love from Ate Linda & Kuya Tony, Adnelle, but we have to let them go, especially your mom. So attached kami sa kanya. It is never easy to lose a parent — but it is the normal course of reality and of life. Being a parent myself, I can only imagine if the opposite reality would hit me — where a child goes before his mother or father. That would probably be even more painful. But as I am sure you already know, God never gives us challenges that He knows we cannot handle. So this pain, this grief, can only make you stronger. I wonder how you managed to keep that photo (almost 10 years old). I remember the time you stood up to take the photo that’s why you were not in the picture.